Florida's Circumnavigational Saltwater Paddling Trail consists of 1,550 miles of pure fun, sun and excellent local Blueways for kayak and canoe enthusiasts. If you like paddling saltwater, this is the place to be! Surrounded by oak scrub and pasture lands, the Peace River trail flows for 57 miles through south central Florida. The river is popular for fossil hunting and large sandbars make a great place to take a break. 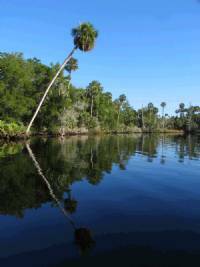 The Great Calusa Blueway paddling trail takes you through coastal Southwest Florida, along routes where Calusa Indians once traveled, past pristine islands and waters teeming with fish and other wildlife. 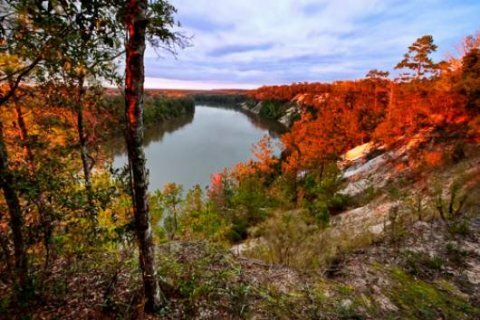 The upper Suwannee River features high banks lined with arching live oaks, pines, and cypress. 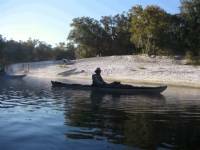 White sand beaches make for good campsites or you can use screened pavilions or rent cabins at one of several "river camps" established for the Suwannee Wilderness Trail. The river also boasts more than 70 springs, many of which are found in the middle section. There are over 600 freshwater springs throughout central and northern Florida. Flowing springs with temperatures usually in the low 70s during the summer dot the Central Florida landscape. But they're certainly more than just nature's swimming pools. Natives and visitors alike flock to the refreshing waters for canoeing, kayaking, tube floating, manatee watching, scuba diving, snorkeling, picnicking, nature walks and more. The region's rivers and lakes also provide exceptional paddling opportunities. Situated between the Gulf of Mexico and the upland bluffs of Florida lie the "Waterways of North Florida". This sparsely populated area has remarkable geology, abundant wildlife, and incredible biodiversity. 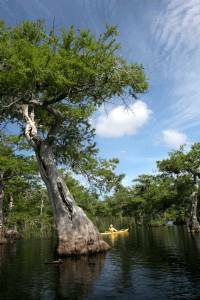 Vast river basins provide scenic waterways enticing paddlers of all ability levels. It is truly a place to enjoy nature at its best. This unspoiled coastline between the St. Marks River and Lower Withlacoochee River boasts one of the longest and wildest publicly-owned coastal wetlands in the United States, and a striking array of bird and marine life. Seven designated primitive campsites have been set up exclusively for paddlers and a handful of small coastal communities provide opportunities for resupply. Since much of the region is remote and cell phone coverage is limited, experience in open water coastal paddling is recommended. Would you like to help FPTA promote the Blueway Community Program? You can! Please contact president@floridapaddlingtrails.com for more info. Thank you.